The release of more new music by Paul McCartney again puts his solo work into the spotlight, nearly a half century after the breakup of the Beatles. The conventional wisdom is that McCartney’s AM-radio-centric solo career is disappointing and even embarrassing in comparison to his seminal work with the Fab Four. But there’s also a compelling case that it can be fairly categorized as the crowning achievement of the greatest artistic career of our time. McCartney did not do his solo legacy any favors by providing detractors with ammo by saying in a recent interview that Wings was a “terrible” band. They weren’t, unless, of course, you’re comparing them to the Beatles. Lennon later said he regretted that broadside, arguing (rather unconvincingly) that the song was really about himself. But the die was cast. McCartney was merely a pop creature and not a true artist. The cruelty of Lennon’s insult (or, perhaps, its genius) is that it turned McCartney’s strength as a songwriter—his gift for dramatic yet infectious melody—into artistic baggage. This jujitsu made McCartney’s historic pace of piling up No. 1 hits into an ever-expanding indictment of his rock bonafides. Lennon could win the battle for Beatles supremacy without really having to lift a finger, which he actually did not do at all for the back-half of the 1970s while McCartney dominated the charts. But commercial success is actually an important measure of artistic achievement. No one sets out to make unpopular art. So let’s dispense with the insanity of counting broad appeal as a black mark against Sir Paul. Yes, artistic credibility beyond the popularity of your work is, of course, important, too. Can any of McCartney’s solo work can stand alongside the work of the Beatles? Given that the Beatles set a bar higher than any band, just reaching it even intermittently is an irrefutable measure of excellence. And finally there is the matter of time — how long was McCartney at or near the top of his powers. Was his peak relatively short given he hasn’t had a hit for over 30 years? If McCartney can check all these boxes affirmatively, there’s can be no doubt his solo career counts as a smash. McCartney’s popularity as a solo artist is matched by only a handful of artists in rock history. He topped the charts post-Beatles nine times, a mark surpassed by just 10 artists, including the Beatles. Among solo artists that can be classified as rock, McCartney’s total of No. 1 songs is surpassed by just Elvis Presley (18) and Stevie Wonder, whose 10 include “That’s What Friends Are For.” That charity effort for AIDS research also counts as a chart topper for Elton John, who otherwise has one less No. 1 hit than McCartney. And McCartney also has 23 top 10 hits, comparable to the totals compiled by Wonder (28) and John (27). So McCartney followed up his time in the biggest commercial musical act in history with basically the solo career of Elton John or Stevie Wonder. 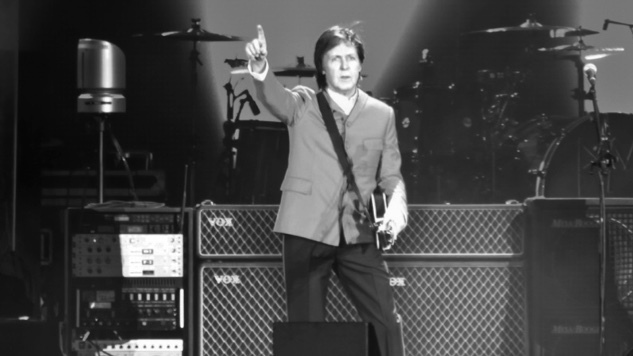 McCartney’s solo career is most identified with AM radio during a time when rock’s coolness was quantified by its presence on FM, a format that he and the Beatles helped create. September’s Egypt Station will be McCartney’s 25th solo album. He has been relentless, in stark contrast to both Lennon and Harrison before their deaths. Not only did Lennon not release anything between 1975 and 1980 (an unheard of amount of time for the era) but Harrison did not release an album in the 14 years preceding his 2001 death. Yet it’s fair to say that McCartney has just one widely recognized album that can stand with the Beatles—Band on the Run. Says Rodriguez, “Band on the Run and Tug of War are the most universally regarded highlights of Paul’s solo career. Runners up would include Venus and Mars, McCartney I, Flowers in the Dirt and Flaming Pie. Again, if you are a McCartney fan, these are solid releases.” But, Rodriguez says, none are comparable to The Beatles. That’s the other point about Paul solo—he took it quite literally initially by becoming a one-man band. Other critics, it should be noted, count “Maybe I’m Amazed” is one of the best songs McCartney ever wrote, including McCartney, who said he wanted to be remembered for it. Sharp readers will notice that none of the songs listed as McCartney’s best were released after 1980’s “Coming Up,” which reportedly inspired Lennon to record music again. There have been some gems more recently but there’s no denying the many misses, too. Yet the arc of the careers of Wonder and Elton John are very similar. And that’s no surprise. “The expectation for anybody to sustain pushing the paradigm of rock’n’roll in their 30s like they had in their 20s is virtually unheard of and unreasonable,” notes Rodriguez, whose Beatles books include Solo In The 70s: John, Paul, George, Ringo 1970-1980. Time is the arch nemesis of all musicians. Mental prowess begins to decline age 27, according to recent research. While there is a belief that creativity peaks later, at age 42, rock musicians were not specifically studied. If you look at Rolling Stone magazine’s consensus top 10 rock albums of all time, the average age of the main creators upon release was 26 and just one artist — Marvin Gaye — was over 30 (he was 32 when What’s Going On was released). And note the reason of later peak creative development in literature and more classical forms of music is believed to be related to the amount of study and practice required before one can begin to innovate. But McCartney was a pioneer and thus blossomed at a very young age. So he’s more like Albert Einstein in science, who had his “miracle year” of 1905 at age 26—perhaps because he had the field to himself. So McCartney had less genius left to mine as he aged. Yet he carried his peak into at least his late 30s. Wonder in comparison was 28 when the last of a similar list of his top songs was released. Commercial success is a gigantic win for McCartney. And like the inner-circle Hall of Fame baseball player, he maintained his artistic peak for much longer than could reasonably be expected, a fact obscured by his many subsequent releases (most of which have their moments up to and including his latest single). The only controversial measure of McCartney’s solo greatness is artistic success, almost hopelesly subjective. Viewing McCartney so seriously cuts against his gift of bringing as much joy as possible into the world through his music. He expressed this most movingly in the coda to his first career, “And in the end, the love you take is equal to the love you make.” A long-ago review of “Silly Love Songs” sums this up best and with it McCartney himself: “An exemplary piece of pop production and a pure pleasure.” If that isn’t artistic success, what is it?